Flooding affected Alton Road and West Avenue on South Beach and Cordova Road in Broward. When the sun went down Thursday night, the water came up in Miami Beach, as higher than average tide levels again caused minor flooding. There was no rain, but Alton Road was flooded, as cars drove in the water, and people cycled and walked through it. "Well, my phone just broke through it, so yeah, just trucking through," Australian tourist Jaayde Tyrell said. "We were here earlier today, and it wasn't this bad." The same phenomenon happened 12 hours earlier, when Miami Beach residents drove down flooded streets during their morning commute despite clear skies. 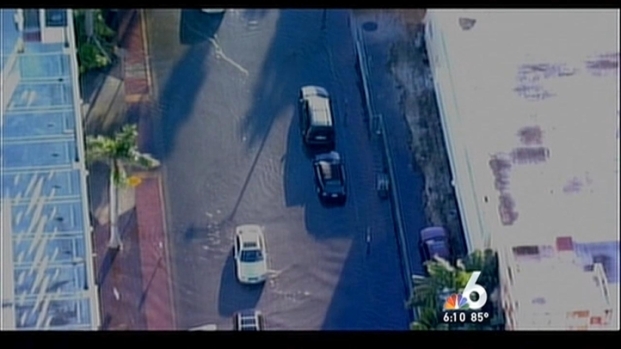 Despite the clear skies, Miami Beach residents drove down flooded streets during their morning commute Thursday. NBC 6's Laura Rodriguez reports. The high tide levels are causing minor flooding along the Atlantic coast of South Florida and the flooding is expected to continue for the next several days. The National Weather Service refers to it as "spring tide," not because of the season, but because it is common for water levels to spring up in September and October. "When the sun, moon and Earth are aligned, that's what causes the gravitational pull on the surface of the Earth which then acts to raise the water levels," said Robert Molleda, a meteorologist with the NWS. Water levels were expected to run between half a foot to a foot above normal through the weekend from lower Palm Beach County through Miami-Dade County, according to the NWS. Molleda says flooding is occurring more on the bay and the inter-coastal side on streets with low elevations like Alton Road, with water going higher than curb level. "It's been a headache for a couple of months now, but for the past couple of days it's been worst than I've ever seen it," said Justen Thomas, a resident of Miami Beach. Puddles of water made it difficult for residents to go in and out of local businesses. "You have to walk down the middle of the street or step in two feet of water just to do your shopping," said Thomas. Driving and parking are also an issue anytime water levels are high because of corrosion. "I wash the undercarriage of my car pretty frequently because I'm worried about that saltwater," said Chad Fahlberg, a resident of Miami Beach. A spokesperson for the City of Miami Beach said drainage improvements would be addressed in the Alton Road Project. Flooding has also affected portions of Cordova Road in Broward, the NWS said. The worst flooding will occur during high tide, generally around 8 a.m. and 8 p.m., and will last for two to three days after Saturday's full moon. Residual flood water could remain on roadways outside the high tide cycle.